The dynamic movement primitive (DMP) framework was designed for trajectory control. It so happens that in previous posts we’ve built up to having several arm simulations that are ripe for throwing a trajectory controller on top, and that’s what we’ll do in this post. The system that we will be controlling here is the 3 link arm model with an operational space controller (OSC) that translates end-effector forces into joint torques. The DMPs here will be controlling the trajectory of the hand, and the OSC will take care of turning the desired hand forces into torques that can be applied to the arm. All of the code used to generate the animations throughout this post can of course be found up on my github (to run play around with variants of python run.py arm3 dmp write). We have our 3 link arm and its OSC controller; this whole setup we’ll collectively refer to as ‘the plant’ throughout this post. We are going to pass in some force signal to the plant, and the plant will carry it out. Additionally we’ll get a feedback signal with the position of the hand. At the same time, we also have a DMP system that’s doing its own thing, tracing out a desired trajectory in space. We have to tie these two systems together. where is the state of the DMP system, is the state of the plant, and and is the position error gain term. Once we have this, we just go ahead and step our DMP system forward and make sure the gain values on the control signal are high enough that the plant follows the DMP’s trajectory. And that’s pretty much it, just run the DMP system to the end of the trajectory and then stop your simulation. To give a demonstration of DMP control I’ve set up the DMP system to follow the same number trajectories that the SPAUN arm followed. As you can see the combination of DMPs and operational space control is much more effective than my previous implementation. One of the issues in implementing the control above is that we have to be careful about how quickly the DMP trajectory moves, because while the DMP system isn’t constrained by any physical dynamics, the plant is. Depending on the size of the movement the DMP trajectory may be moving a foot a second or an inch a second. You can see above that the arm doesn’t fully draw out the desired trajectories in places where the DMP system moved too quickly in and out and sharp corners. The only way to remedy this without feedback is to have the DMP system move more slowly throughout the entire trajectory. What would be nice, instead, would be to just say ‘go as fast as you can, as long as the plant state is within some threshold distance of you’, and this is where system feedback comes in. 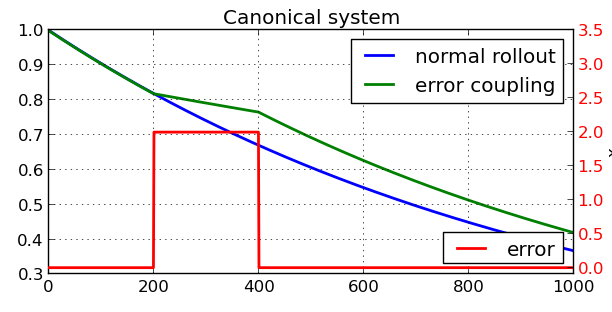 All this new term does is slow down the canonical system when there’s an error, you can think of it as a scaling on the time step. 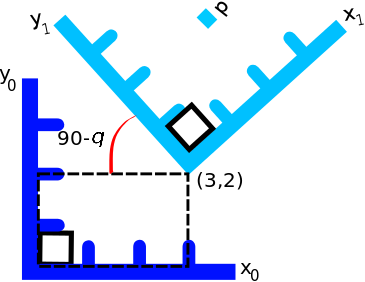 Additionally, the sensitivity of this term can be modulated the scaling term on the difference between the plant and DMP states. These two examples are a pretty good case for including the feedback term into your DMP system. You can still see in the second case that the specified trajectory isn’t traced out exactly, but if that’s what you’re shooting for you can just crank up the to make the DMP timestep really slow down whenever the DMP gets ahead of the plant at all. Now, using the above described interpolation function we can just directly use its output to guide our system. And, in fact, when we do this we get very precise control of the end-effector, more precise than the DMP control, as it happens. The reason for this is because our DMP system is approximating the desired trajectory and with a set of basis functions, and some accuracy is being lost in this approximation. Some basic examples of using DMPs to control the end-effector trajectory of an arm with operational space control were gone over here, and you can see that they work really nicely together. I like when things build like this. We also saw that power of DMPs in this situation is in their generalizability, and not in exact reproduction of a given path. If I have a single complex trajectory that I only want the end-effector to follow once then I’m going to be better off just interpolating that trajectory and feeding the coordinates into the arm controller rather than go through the whole process of setting up the DMPs. Drawing words, though, is just one basic example of using the DMP framework. It’s a very simple application and really doesn’t do justice to the flexibility and power of DMPs. Other example applications include things like playing ping pong. 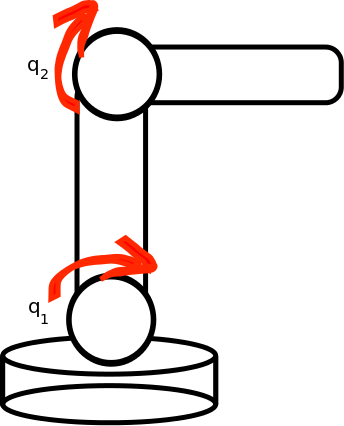 This is done by creating a desired trajectory showing the robot how to swing a ping pong paddle, and then using a vision system to track the current location of the incoming ping pong ball and changing the target of the movement to compensate dynamically. There’s also some really awesome stuff with object avoidance, that is implemented by adding another term with some simple dynamics to the DMP. Discussed here, basically you just have another system that moves you away from the object with a strength relative to your distance from the object. You can also use DMPs to control gain terms on your PD control signal, which is useful for things like object manipulation. And of course I haven’t touched on rhythmic DMPs or learning with DMPs at all, and those are both also really interesting topics! But this serves as a decent introduction to the whole area, which has been developed in the Schaal lab over the last decade or so. I recommend further reading with some of these papers if you’re interested, there are a ton of neat ways to apply the DMP framework! And, again, the code for everything here is up on my github in the control and pydmps repositories. In the last post, I went through how to build an operational space controller. It was surprisingly easy after we’ve worked through all the other posts. But maybe that was a little too easy for you. Maybe you want to do something more interesting like implement more than one controller at the same time. In this post we’ll go through how to work inside the null space of a controller to implement several seperate controllers simultaneously without interference. The last example comprises the basics of operational space control; describe the system, calculate the system dynamics, transform desired forces from an operational space to the generalized coordinates, and build the control signal to cancel out the undesired system dynamics. Basic operational space control works quite well, but it is not uncommon to have several control goals at once; such as `move the end-effector to this position’ (primary goal), and `keep the elbow raised high’ (secondary goal) in the control of a robot arm. If the operational space can also serve as generalized coordinates, i.e. if the system state specified in operational space constrains all of the degrees of freedom of the robot, then there is nothing that can be done without affecting the performance of the primary controller. 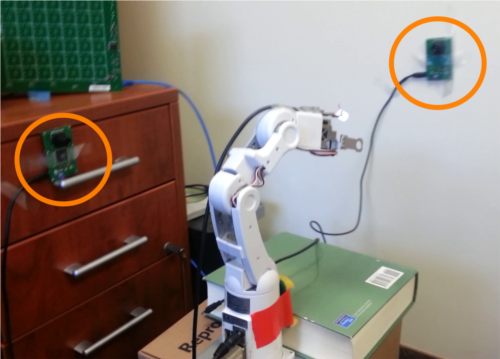 In the case of controlling a two-link robot arm this is the case. 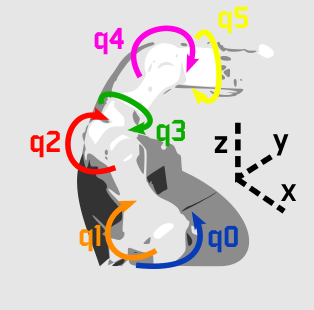 The end-effector Cartesian space (chosen as the operational space) could also be a generalized coordinates system, because a specific position fully constrains the position of the arm. But often when using operational space control for more complex robots this is not the case. In these situations, the forces controlled in operational space have fewer dimensions than the robot has degrees of freedom, and so it is possible to accomplish the primary goal in a number of ways. The null space of this primary controller is the region of state space where there is a redundancy of solutions; the system can move in a number of ways and still not affect the completion of the goals of the primary controller. An example of this is all the different configurations the elbow can be in while a person moves their hand in a straight line. In these situations, a secondary controller can be created to operate in the null space of the primary controller, and the full control signal sent to the system is a sum of the primary control signal and a filtered version of the secondary control signal. In this section the derivation of the null-space filter will be worked through for a system with only a primary and secondary controller, but note that the process can be applied iteratively for systems with further controllers. where is the pseudo-inverse of . it can be seen that the Jacobian transpose multiplied by its pseudo-inverse will be 1’s all along the diagonal, except in the null space. This means that is subtracted from itself everywhere that affects the operational space movement and is left to apply any arbitrary control signal in the null space of the primary controller. Unfortunately, this initial set up does not adequately filter out the effects of forces that might be generated by the secondary controller. The Jacobian is defined as a relationship between the velocities of two spaces, and so operating in the null space defined by the Jacobian ensures that no velocities are applied in operational space, but the required filter must also prevent any accelerations from affecting movement in operational space. The standard Jacobian pseudo-inverse null space is a velocity null space, and so a filter built using it will allow forces affecting the system’s acceleration to still get through. What is required is a pseudo-inverse Jacobian defined to filter signals through an acceleration null space. it becomes clear that to not cause any unwanted movement in operational space the second term must be zero. There is only one free term left in the second term, and that is the pseudo-inverse. There are numerous different pseudo-inverses that can be chosen for a given situation, and here what is required is to engineer a pseudo-inverse such that the term multiplying in the above operational space acceleration equation is guaranteed to go to zero. This specific Jacobian inverse was presented in this 1987 paper by Dr. Oussama Khatib and is called the `dynamically consistent generalized inverse’. Using this psuedo-inverse guarantees that any signal coming from the secondary controller will not affect movement in the primary controller’s operational space. Just as a side-note, the name ‘pseudo-inverse’ is a bit of misnomer here, since it doesn’t try to produce the identity when multiplied by the original Jacobian transpose, but hey. That’s what they’re calling it. We did it! This will now allow a high-priority operational space controller to execute without interference from a secondary controller operating in its null space to complete it’s own set of goals (when possible). this example will construct the control system for a primary controller controlling the end-effector and a secondary controller working to keep the arm near its joint angles’ default resting positions. where is a gain term. where is the dynamically consistent generalized inverse defined above, and is our null space signal! It’s a lot of math, but when you start to get a feel for it what’s really awesome is that this is it. We’re describing the whole system, and so by working with these equations we can get a super effective controller. Which is pretty cool. Especially in relation to other possible controllers. Alright! We’ve now worked through all the basic theory for operational space control, it is time to get some implementations going. In this post we’ll look at operational space control and how to derive the control equations. I’d like to mention again that these posts have all come about as a result of me reading and working through Samir Menon’s operational space control tutorial, where he works through an implementation example on a revolute-prismatic-prismatic robot arm. 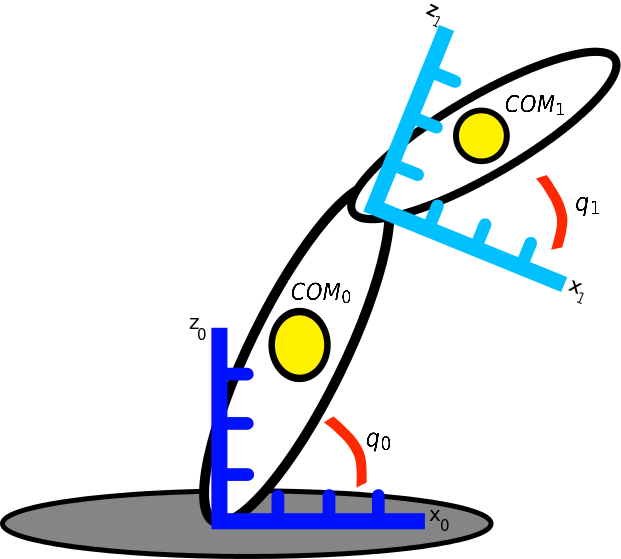 The term generalized coordinates refers to a characterization of the system that uniquely defines its configuration. For example, if our robot has 7 degrees of freedom, then there are 7 state variables, such that when all these variables are given we can fully account for the position of the robot. 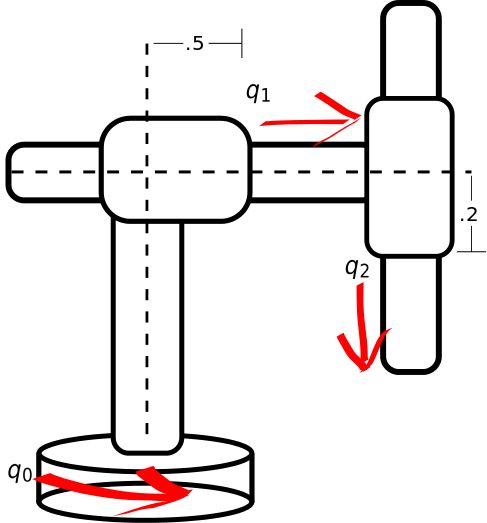 In the previous posts of this series we’ve been describing robotic arms in joint space, and for these systems joint space is an example of generalized coordinates. 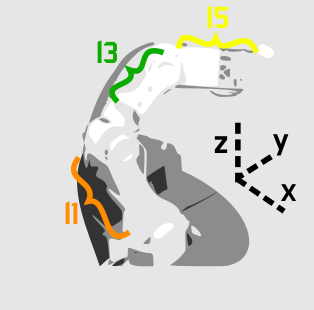 This means that if we know the angles of all of the joints, we can draw out exactly what position that robot is in. 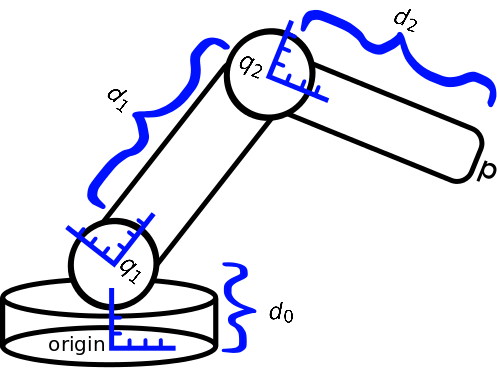 An example of a coordinate system that does not uniquely define the configuration of a robotic arm would be one that describes only the position of the end-effector. So generalized coordinates tell us everything we need to know about where the robot is, that’s great. The problem with generalized coordinates, though, is that planning trajectories in this space for tasks that we’re interested in performing tends not to be straight forward. For example, if we have a robotic arm, and we want to control the position of the end-effector, it’s not obvious how to control the position of the end-effector by specifying a trajectory for each of the arm’s joints to follow through joint space. The idea behind operational space control is to abstract away from the generalized coordinates of the system and plan a trajectory in a coordinate system that is directly relevant to the task that we wish to perform. Going back to the common end-effector position control situation, we would like to operate our arm in 3D Cartesian space. In this space, it’s obvious what trajectory to follow to move the end-effector between two positions (most of the time it will just be a straight line in each dimension). So our goal is to build a control system that lets us specify a trajectory in our task space and will transform this signal into generalized coordinates that it can then send out to the system for execution. where is end-effector acceleration, and is the inertia matrix in operational space. Unfortunately, this isn’t just the normal inertia matrix, so let’s take a look here at how to go about deriving it. Being able to calculate allows inertia to be cancelled out in joint-space by incorporating it into the control signal, but to cancel out the inertia of the system in operational space more work is still required. The first step will be calculating the acceleration in operational space. This can be found by taking the time derivative of our original Jacobian equation. And that’s why and how the inertia matrix in operational space is defined! where is the same as defined in the previous post. This controller converts desired end-effector acceleration into torque commands, and compensates for inertia and gravity. Hurray! That was relatively simple. The great thing about this, though, is that it’s the same process for any robot arm! So go out there and start building controllers! Find your robot’s mass matrix and gravity term in generalized coordinates, the Jacobian for the end effector, and you’re in business. So, this feels a little anticlimactic without an actual simulation / implementation of operational space, but don’t worry! As avid readers (haha) will remember, a while back I worked out how to import some very realistic MapleSim arm simulations into Python for use with some Python controllers. This seems a perfect application opportunity, so that’s next! A good chance to work through writing the controllers for different arms and also a chance to play with controllers operating in null spaces and all the like. Actual simulation implementations will also be a good chance to play with trying to incorporate those other force terms into the control equation, and get to see the results without worrying about breaking an actual robot. In actual robots a lot of the time you leave out anything where your model might be inaccurate because the last thing to do is falsely compensate for some forces and end up injecting energy into your system, making it unstable. There’s still some more theory to work through though, so I’d like to do that before I get to implementing simulations. One more theory post, and then we’ll get back to code! I’m doing a tour of learning down at the Brains in Silicon lab run by Dr. Kwabena Boahen for the next month or so working on learning a bunch about building and controlling robots and some other things, and one of the super interesting things that I’m reading about is effective methods for force control of robots. 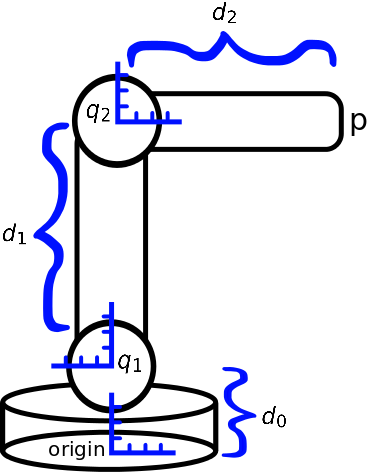 I’ve mentioned operational space (or task space) control of robotic systems before, in the context of learning the inverse kinematic transformation, but down here the approach is to analytically derive the dynamics of the system (as opposed to learning them) and use these to explicitly calculate control signals to move in task space that take advantage of the passive dynamics of the system. 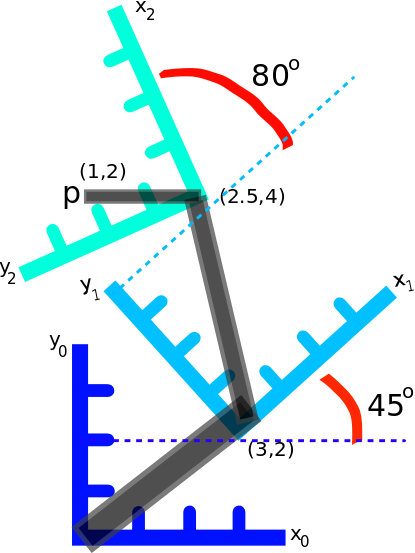 where two joints rotate, and are referred to as , and , respectively, then the most obvious representation for the system state, , is the joint-angle space . So that’s great, but often when we’re using this robot we’re going to be more interested in controlling the position of the end-effector rather than the angles of the joints. We would like to operate to complete our task in terms of , where are the Cartesian coordinates of our hand in 2D space. So then is our operational (or task) space. I also mentioned the phrase ‘passive dynamics’. It’s true, go back and check if you don’t believe me. Passive dynamics refer to how the system moves from a given initial condition when no control signal is applied. For example, passive dynamics incorporate the effects of gravity on the system. If we put our arm up in the air and remove any control signal, it falls down by our side. The reason that we’re interested in passive dynamics is because they’re movement for free. So if my goal is to move my arm to be down by my side, I want to take advantage of the fact that the system naturally moves there on it’s own simply by removing my control signal, rather than using a bunch of energy to force my arm to move down. There are a bunch of steps leading up to building controllers that can plan trajectories in a task space. 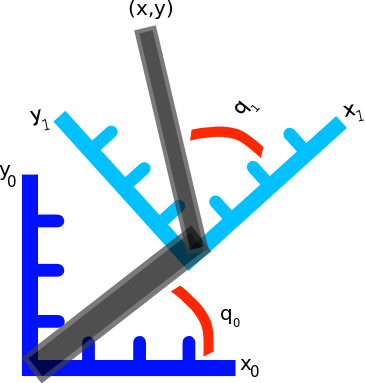 As a first step, it’s important that we characterize the relationship of each of reference coordinate frames of the robot’s links to the origin, or base, of the robot. The characterization of these relationships are done using what are called forward transformation matrices, and they will be the focus of the remainder of this post. It’s not as straightforward once rotations start being introduced. 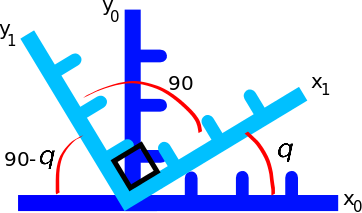 So what we’re looking for is a method of automatically accounting for the rotations and translations of points between different coordinate frames, such that if we know the current angles of the robot joints and the relative positions of the coordinate frames we can quickly calculate the position of the point of interest in terms of the origin coordinate frame. which takes the position of and maps it to . which is equivalent to , as shown above. where is called a rotation matrix. The notation used here for these matrices is that the reference frame number being rotated from is denoted in the superscript before, and the reference frame being rotated into is in the subscript. denotes a rotation from reference frame 1 into reference frame 0 (using the same notation as described here. To find the location of a point defined in reference frame 1 in reference frame 0 coordinates, we then multiply by the rotation matrix . Alrighty, rotation is great, but as you may have noticed our robots joints are not all right on top of each other. The second part of transformation is translation, and so it is also necessary to account for distances between reference frame origins. To get the coordinates of in reference frame 0 now simply take the first two elements of the resulting vector . So let’s give it a shot! By eyeballing it we should expect our answer to be somewhere around or so, I would say. And it’s a good thing we didn’t just eyeball it! Accurate drawings might have helped but the math gives us an exact answer. Super! and simply multiply our point in reference frame 2 by this new transformation matrix to calculate the coordinates in reference frame 0. The example here is taken from Samir Menon’s RPP control tutorial. where the third column indicates that there was no rotation around the axis in moving between reference frames, and the forth (translation) column shows that we move 1 unit along the axis. The fourth row is again then only present to make the multiplications work out and provides no information. These are, of course, just the basics with forward transformation matrices. There are numerous ways to go about this, but this method is fairly straightforward. If you’re interested in more, there are a bunch of youtube videos and detailed tutorials all over the web. There’s a bunch of neat stuff about why the matrices are set up like they are (search: homogeneous transformations) and more complex examples. The robot example for the 3D case here didn’t have any spherical joints, each joint only moved in 2 dimensions, but it is also possible to derive the forward transformation matrix in this case, it’s just more complex and not necessary to move onward here since they’re not used in the robots I’ll be looking at. This introduction is enough to get started and move on to some more exciting things, so let’s do that!